A Greyhound Bus for the apocalypse. Remember riding the school bus with its hard, cracked vinyl, ominous smell of mysterious bodily fluids, and less-than-comfortable ride? It’s hard to forget cramming into those tiny, uncomfortable seats, riding miles to school in the morning dark, cold, and bouncing all over. But there’s a difference between carting kids to school and moving adults. Adults like comfort, entrainment, and the ability to control the temperature. But what happens when you have to combine the creature comforts of a charter bus and the necessary capacity to go off-road? 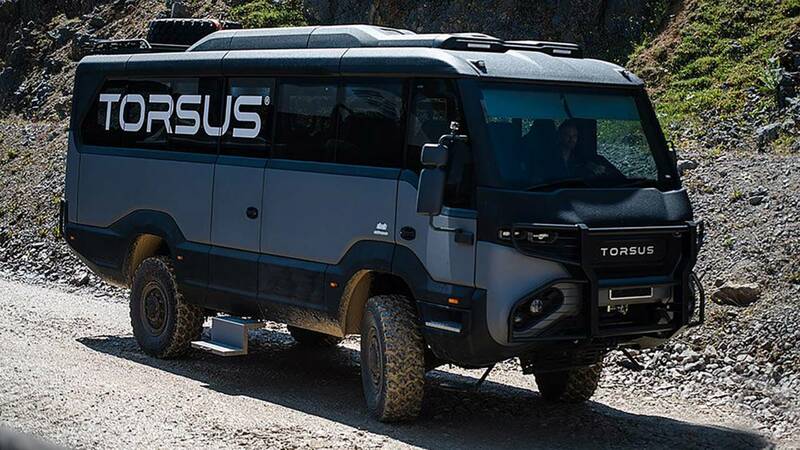 You get the Torsus Praetorian, a rugged off-road bus that’s perfect for traversing a dystopian hellscape or Michigan roads. The Torsus Praetorian claims to be the world’s first heavy-duty off-road bus – and it certainly has the chops to claim both attributes. It seats up to 35 people plus their equipment while having 15.78 inches (400 millimeters) of ground clearance. It can ford up to 27.5 inches of water (700 mm). That sounds perfect for an off-road bus. It’s designed to get people to hard-to-reach places around the world for things such as specific industries – oil and gas, forestry, and mining – disaster and emergency response, and expeditions, safaris, and ski resorts. The Praetorian packs a 6.9-liter, six-cylinder diesel engine making 240 horsepower (176 kilowatts) and 682 pound-feet (925 Newton-meters) of torque. Top speed is electronically limited to just 72 miles per hour (117 kilometers per hour), which makes sense. That’s a massive wall trying to move through the air. It comes in either right- or left-hand drive. The Praetorian is impressive – a utilitarian workhorse that’s capable of delivering personnel to remote parts of the world. But it can do so in some luxury. Each seat – which is adjustable – features a three-point seatbelt. There’s a central DVD player with speakers tucked in the luggage rack. The windows are tinted, and each seat comes with a travel light and air conditioning defectors. The Torsus Praetorian looks ridiculous. It’s a massive people hauler designed to conquer Mt. Everest. If schools had these, kids would be a lot more excited to ride the bus.